Here's something for every MMO player who likes to vacuum up quests without reading the mission text: a 40 minute video summarising the bulk of Warcraft's story. It covers the series' main timeline, from events depicted in the old RTS games, to the evolving lore of World of Warcraft. 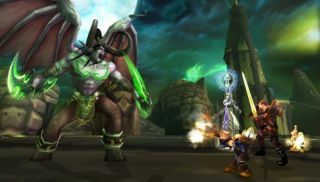 It's the perfect guide if you want to catch up ahead of Warlords of Draenor, or if you just want to know why you beat up a demon guy that one time. The video was created by "Nobbel87", and is the latest in a full and lengthy series detailing Warcraft's lore. The one thing it doesn't explain? Why Blizzard were showing off bra-wearing cow-people .